Journaling. Publicised like crazy and definitely a pastime that has won my heart. ‘They’ say journalling is therapeutic. Spaghetti braining it’s way out of ones head and onto paper. Helpful? Yes, I believe so. Reading back over my journals takes me to a place of familiarity. It sounds like my head yet seldom do I recall writing it. Enabling me to focus and grab a sense of what I should be doing, what I need to be doing on this complicated earth while floating and dodging my way through this thing called life. What will happen if I go there instead? How do I know I’m in the right job/right partner/right country? Am I destined for better things? Is this you and your thoughts too? Finding a little gem over on my Twitter, I realised there is a thing called Najowrimo. You may remember I participated in July. 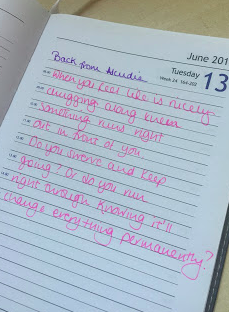 Journalling through July I loved reading back over my najowrimo journey. Excited, I realise this also happens in October 1st again for a month! For me, there will become a time when I sense a need to publish my najowrimo in a book. For you, maybe the same, maybe not. Let me say this, you are likely writing the story of your life as well as someone else’s. Write to them. Solve their issue and your books will fly off the virtual shelves. See my pages I have written before.